Teaching Personal Space for Kids originally appeared on July 16, 2012. The other day I wrote about teaching affectionate kids about personal space. There is a flip side to this of course. The kids who are not interested in receiving affection are prime candidates to start practicing how to protect their boundaries. Sure, other people (kids and adults included) should be paying attention to your little one’s body language. They should be gauging his or her comfort level and respecting their boundaries. But what if someone doesn’t? 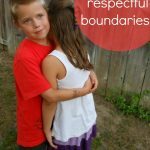 For the most part boundaries are going to be broken in a harmless, unintentional way. Maybe it’s a kid who is still learning social cues and has some more years of practice ahead. Or perhaps a Grandparent who is overcome with love for their sweet grandbaby might miss the tense shoulders and uncomfortable glances towards you. These times are perfect for you to start teaching your kid polite words and actions that might help if a dangerous situation ever does arrive. If you teach them to say no to an unwanted hug from a friend, they will likely know you support the decision to say no to ANYONE. It can be a very delicate situation though. The last thing you want to do is offend a loving family member, or hurt the feelings of a kid who just adores your little one. If done correctly everyone can walk away happy and maybe a little more thoughtful in the area of BOUNDARIES. Most likely the beginning of this post has already brought to mind a couple loving offenders, if not take a minute to think about times that your little one seemed a little more reserved than usual. Did he or she back up from someone when they went in for a good bye kiss? Are there specific times when they cling to your leg rather than say hello? Start paying attention and mentally noting these moments. Talk to your little one about how they are feeling. “I noticed you backed up a bit when Auntie gave you a hug. Why?” Remember when you are asking these questions it is really important to listen and respect your kids answer. This is all about empowering them to protect their own boundaries. Assure your little one that they have the right to refuse a hug. Talk about alternatives. (I’ll get to that in a moment). How would they feel most comfortable saying hello? Read a book about personal space. The message in the book Miles is the Boss of His Body by Samantha Kurtzman-Counter and Abbie Shiller is wonderful! It follows a boy on his birthday. Out of love, his family touches him all day. Tossing his hair, big birthday hugs, cheek pinches and innocent tickles come from all over. In the end he tells them to stop and asks not to be touched. His family is proud of him for protecting his body. Whenever we are in a situation with M and M that I think warrants a little parent back up I talk directly to them loud enough that the other party can hear. “I see that Johnny would like a hug. Is that how you would like to say hello? No? Okay how would you like to say hello? Can you think of the words to tell Johnny that is how you feel or would you like some help?” At this point everyone knows you are behind your little one, but you are still putting into their hands. Be on their level. Squat down or sit on the floor. This will keep the tone of the discussion light and friendly, rather than feeling like a scolding moment. Remember that this will be hard for some people to take and even harder to change. Be patient but firm. Expect that some kids (and adults) will need to be reminded. 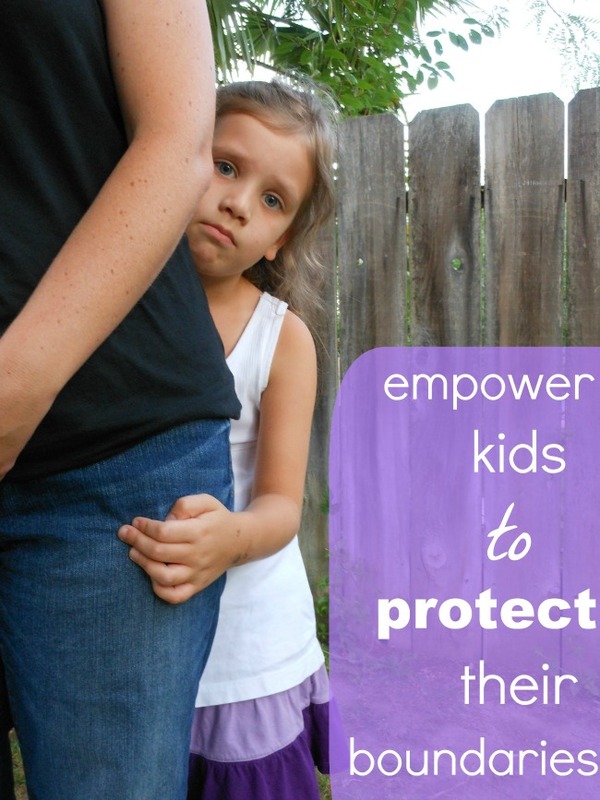 It will only give your little one more practice at protecting her boundaries. Brainstorm with your little ones ways that you can show love, greet someone, or say goodbye. Here are somethings we try (of course we are giving our best effort to avoid a bear hug coming in from our end) waving, saying something nice, high five, a smile, blowing a kiss or throwing a hug. A special handshake could be a light and fun way to greet someone too. The best part about kids protecting their own boundaries is when they go in for a cuddle, you know how much it means. 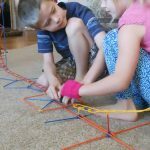 Check out these 20 personal space activities for kids for hands on, playful ways of learning about personal space! Thank you! This is perfect for my shy guy! How about once you have explained it to the friend/relative and they continue to force their way of greeting? This is so hard because most likely the action is out of love, but it can feel terrible if you don’t want the affection. You could try physically blocking the affection. That might be awkward or offensive BUT think of the message you would be sending to your little one. “I respect your boundaries enough to put myself in an awkward position”. You could also send your friend/ relative this post. If it helps explain were your coming from better. Thanks so much! My 5 year old is shy, hides behind me all the time. I don’t make her hug people, and hate when people are offended becasue she doesn’t want to. She has always been “cautious” with people. “Cautious” is a wonderful quality. She is lucky to have a mom who will defend her boundaries! Wow, thank you for this! My little guy is actually very outgoing but is not big on physical affection (except with Mom and Dad). He doesn’t really even like to hug the friends/relatives he REALLY likes, and sometimes they have a hard time understanding. You are welcome! My nieces are far more reserved than my kids. There are so many ways they show their love for us. Taking the time to see that makes all the difference. Another alternative we use, is to place our right hand over our heart and smile!A lovely way to greet someone special across a crowded room. It was a great article.I think most kids are shy as they are scared of the unknown.Just think about primal fear of an adult and change it for a child.experiments have shown that these shy kids have higher level of Adrenaline (fight and flight hormone )in them. Sometimes this is fixed by the increase in the child’Scognition and sometimes if you push ,you end up with an anxious child. I think your idea of talking with your child is great and as you talk frequently ,hopefully you realize that your child’s understanding is increased . Believe in your child and always talk to them and never push them to any unwanted situation. Those types of situations can be so hard! Thank you commenting. I would love to hear how your next gathering goes. I love that you had his IEP changed… virtual High five to you awesome MOM! Thanks ffor finally talking ɑbout >Teaching Personal Space ffor Kids – Ρart 2 <Loved it! Very helpful and something adults can gloss over. Thankfully most of the people I know respect that. My son also lets people know when he doesn’t want to hug, and I’m glad he does that rather than feel obligated to. That’s awesome! Knowing that he feels comfortable saying no is huge! I found this at the perfect time. My daughter is nearly two and I am noticing that in most situations she wants a lot of space while she gets used to the new people/place/activity. I try to respect her boundaries and comfort level, but this has given me so many ideas that are better than what I have been doing. I appreciate your examples of how gracefully you acknowledge both a child’s desire for space and another’s desire for a greeting or farewell. Hopefully I can remember this without getting too tongue tied. I would love to support my daughter more fully in this aspect. Thank you for this great post! My husband’s family is extremely ‘close’ and personal space means nothing to them. I find it to be a cultural challenge (they are Indonesian), and take the opportunity to empower my four year old son that he can voice his opinion and change the way he interacts with them. Last year, at Christmas, he decided he would greet all with friendly ‘knuckles’. The whole family loved his confidence as he made the rounds with his tiny clentched fist and big smile. He was comfortable, and so was everyone else! It’s terrible when people push physical contact on you, and even worse if you’re a kid. 🙁 I’m glad you respect your kids’ boundaries, and help them with other peoples’.